Need a book but don’t live as close to a public library as you would like? How about using one of our free community libraries? These free community libraries are being placed in more remote communities throughout Sevier County and are being created using upcycled newspaper boxes that once belonged to The Mountain Press. The boxes have been revised and repainted a bright red that can be easily seen when the free community libraries have been placed. Approximately 24 free community libraries will be placed at various locations around Sevier County by the Sevier County Public Library System (SCPLS). The majority of the locations have been chosen due to the remoteness of the area from a public library that the community can use. The free community libraries have been sponsored by local businesses and individuals including the Anna Porter Public Library in Gatlinburg, the Ashley & Steve Edwards Family and the International House of Pancakes (IHOP). The free community libraries come prefilled with books for all ages and work on an honor system. Everyone is welcome and invited to use the free community libraries. You can take a book(s) and/or add a book that you have enjoyed for someone else to read. The books provided initially come from materials that have been deleted from the SCPLS libraries (King Family Library in Sevierville, Seymour Branch Library in Seymour and the Kodak Branch Library in Kodak) or have been donated to the library by the public. • Sevierville Tax Service, 2805 Old Newport Hwy, Sevierville – Free Community Library for the New Center area. No sponsor. 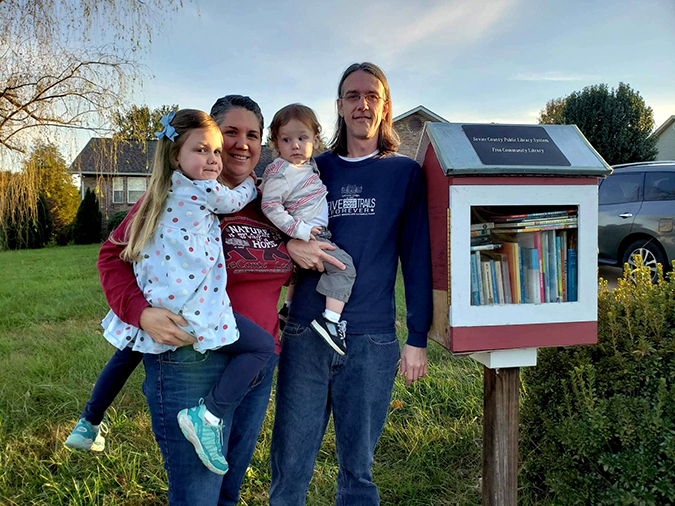 • Ashley and Steve Edwards, 2012 James Road, Sevierville - Free Community Library for the Harrisburg area located in a private neighborhood sponsored by the family. • Ace Hardware, 1025 East Parkway, Gatlinburg – This Free Community Library is one of two boxes sponsored by the Anna Porter Public Library for Gatlinburg. • Food City, 1219 East Parkway, Gatlinburg – This is the second Free Community Library sponsored by Anna Porter Public Library for Gatlinburg. • Jimmy's Exxon Market, 2467 Boyd's Creek Highway, Sevierville - Free Community Library for Boyd's Creek area; No sponsor. • Sevier County Public Library System-Pittman Center Satellite Library, 2839 Webb Creek Road, Pittman Center – This location does not have a newspaper box to choose from but an entire room in the Pittman Center City Hall from which to choose and is sponsored by Pittman Center city officials and mayor at Pittman Center City Hall. • Ellejoy Market and Deli, 2356 Ellejoy Road, Walland - Free Community Library for Wye Road area; No sponsor. • Mike's Market and Deli, 1114 Douglas Dam Road, Dandridge - Free Community Library for Douglas Dam area; No sponsor. While this is the first phase of placements, there are several more free community libraries currently being placed. The SCPLS is looking at possible locations in the following communities where a Free Community Library can be placed: Richardson Cove, Jones Cove, the Glades, Cobbly Nob, Gnatty Branch, Banner (just before tunnel), Beech Springs, White School, Waldens Creek (this free community library has already been sponsored by IHOP, only a location is needed to make the placement), Oldham Creek, Flat Creek, Conner Heights, Walnut Creek, Catons Chapel and Sims Chapel. If you know a location that would meet the needs of many in the communities mentioned above or would like to sponsor a Free Community Library in your location, please call 865-453-3532. Sponsorships will help fund this project and the name of individual and business sponsors will be adhered to the Free Community Library. The Free Community Libraries will be delivered to each location and will be periodically refilled as the boxes become depleted.